Well after a gruelling thirteen hour coach journey followed by a short taxi ride and a slightly more bearable train journey followed by a quick stint on a bus, Jaz and I finally arrived in Sarlat (France). We were greeted by my folks who had come to pick us up. It was a short drive back to theirs but it was a blisteringly hot day! It felt good to be back in France although I had wanted to bring back a big jar of ColaCao and some other goodies from Spain. It seemed only days ago I’d seen my parents, it had actually been about six weeks. I’ve booked flights back to England for the 5th July, I would have returned sooner, but ticket prices were too costly. I have so much to sort out when I get home, I guess this is reality?!! For now, I want to thank everyone. All those who supported my ideas in the beginning, the Frome people who donated or fundraised for me, like the girls of Part 2, Elaine’s and of course my staff who worked along side me at The Crown Hotel. The Frome Times, Somerset Standard and Bath Life for their publicity. The gracious Bill Hodder and other locals who lent me books, followed the blog and donated. (I will return the books)! To family & friends who have shown their support either through words, donations or gifts (or all the above), like Graham Wright who made my beautiful walking stick, that survived almost unscathed, and John Elson who gave me a painted scallop shell (the pilgrims shell) the night before I left, that survived intact (save for a little fading). To my generous family and relatives, thank you. You are all stars! These days everyone’s asking for some kind of donation, I know it can become a little tiring, but with all your support I reached my target. (I just hope I’ve got some nice prints for some of you…)?! To everyone who followed and retweeted and mentioned me on twitter, I’m not a master of twitter yet but I’ve certainly learnt the basics. From the celebrity retweeters like Mr Emilio Estevez, who just happens to have made a film of the Camino called ‘The Way’ starring his father Michael Sheen. A film I’m very interested to watch as the trailers look moving and beautiful. Mr Charley Boorman who I met at the BMW off road school in Wales (although he could have retweeted more seeing as I was raising for UNICEF). I should mention the ‘Long Way Round’ series is a large part of why I chose to support UNICEF. Although my first bike adventure was probably more ludicrous than theirs. Shortly after passing my motorbike test (6 months), having never ridden, I travelled to Australia, bought a Yamaha XT350 and proceeded to ride around the country on all the back roads and through all the national parks. Unfortunately the bike eventually gave up on me and I had to find other forms of transport to continue on. For now, I have photographs to sort and a book to try to put together. Does anyone know a good publisher?! We get up early again, 6am. The four Brazilian guys that Bruno walked with were here last night, I’ll have to let him know. The young guy at the albergue told me last night that there was a bus at 7am to Cee, this would reduce today’s walk from 32km to about 16km. 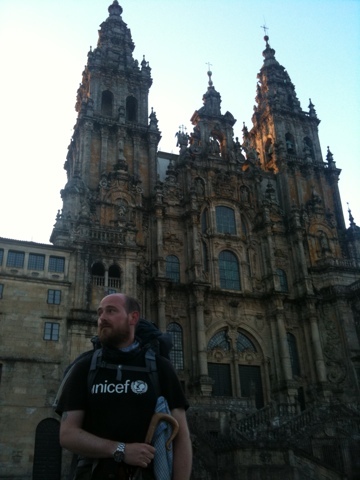 I’m happy to accept this as my UNICEF fundraising was 1500km to Santiago, which I did, in fact it was more than… Walking to Finisterre is for me, but I have to consider Jaz. Like I tell her, it’s more important that she’s ok and doesn’t hurt herself and I see all my Camino friends one last time rather than walking for the sake of walking. Ice achieved what I set out to do, who I am hasn’t changed, I’ve just reaffirmed what I already knew in myself. I have lost nearly 34lbs, but my craving for KFC and McDonalds will probably not help keep that off…!?! Anyway, it’s 7.30am, no buses… Jaz isn’t looking happy! We go back to the albergue and between the owners Spanish and my English and a little sign language we discover theirs no bus until later in the day, but he is going to Cee and will give us a lift! 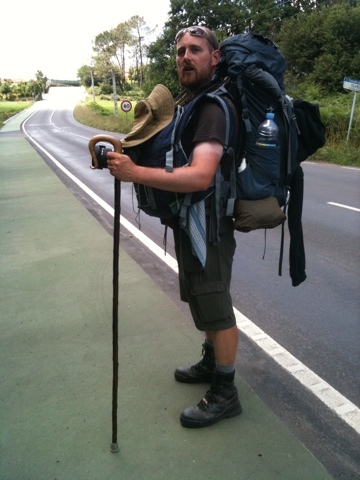 When we arrive in Cee, he points in the direction of the Camino, I throw my backpack on and we set off. After two months of walking it’s amazing to finally see the sea (in Cee). As we walk the route takes us up the hills away from the coast, then brings us back down to it through the small towns and villages. I can’t help but look over the walls as we walk, spotting fish and other sea creatures. 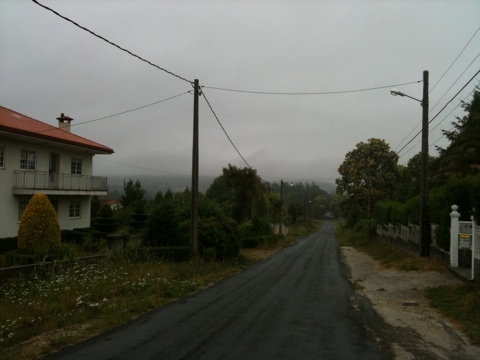 By twelve thirty we arrive in Finisterre, I’m excited to see everyone one last time before we all go our own way. As we walk down the streets, people in doorways try telling us where to stay, it reminds me of Egypt and how pushy people are. We find a very reasonable little hotel down near the harbour front. After booking in, I go to the tourist information where I bump into Nikki, Neville & Ava. We arrange to meet later on for dinner before walking out to the lighthouse. The rest of the afternoon Jaz and I wander and go rockpooling, where we find fish, crabs, starfish and lots of sea anemones… I feel like a kid again, it’s great! We bump into Nikki several times and then find Jonathon, Carlos and Bruno! It’s too late for a siesta so we go and get changed before heading back to find them all. Dinner is full of laughter and enjoyment, and then after, alcohol is bought for watching the sunset at the lighthouse. We make our way along the 3km to the most westerly point of Spain. Tonight marks the end of all our Camino’s… Tomorrow we wake as tourists. For me it still hasn’t sunk in fully, it seems to have gone so fast! I still have to get Jaz and myself home, but first we’re going to make our way back to France to see my parents for a few days. When I get home I have to find a new home, a new job and start sorting through my photographs to see if I can put something together on the Camino. If I can produce any type of photographic journal and get it published, UNICEF will benefit from 75% of any profits. I also have to write more press releases on my return?!! I am going to keep the blog live until my UNICEF page closes at Christmas. I will update with any news that may arise. I should warn you all, I’ve had plenty of time to think of a few new fundraising adventures! Some more extreme, but all will need more thought and support put into them, I hope UNICEF will show me a little support in return? The alarm goes off at 6am, we are up, packed and out by half past. I’m looking forward to walking again but I still worry for Jaz. She takes everything in her stride and after the initial shock of another early morning seems to enjoy the walk. I grumble about finding markers to lead us out of the city, (they all want us to walk in but never want us to leave). Eventually we find the signs and make our way out of Santiago heading towards the sea. The path leads us up and down the rolling landscape between the city and the coast, through more eucalyptus woods and for the first time in Spain, we seem to avoid several villages. The first cafe we saw was around 9am, so we stop for a coffee. I have no idea where we are as my Cicerone book is utter trash now, it needs to be burnt at Finisterre… No other guide seems to be directionally challenged quite like Alison Raju’s ‘Way of St James’. We continue to follow the intermittent yellow arrows and shell pillars giving us rough distances. I’m so impressed with Jaz as she marches in front of me up the hills, the clouds have come in and it’s now drizzling, it’s also still very warm. It reminds me of the rain forests of Australia. By 11.30am we enter Negreira. Jaz And I decide to stop as her legs ache and I’d rather not push her too much today. We sit at a cafe and have a coke before looking for an albergue. We check into the Albergue San José, they give us a quiet corner, still bunk beds but it’s nice. We shower (not together), shop for lunch, eat lunch and siesta (together). Today we have walked 22km, tomorrow is 33km I believe?!! Bruno, Katja and myself had agreed last night to walk in together at sunrise. My alarm goes off at 5.30am, I’d been sensible and pre packed most of my gear last night. By 5.45am I’m pretty much ready, so is Katja but for once Bruno is the slow one… We leave by 6am, walking in darkness until we find our way back onto the Camino at which point we have occasional streetlights. It’s cold but dry which is lovely, we walk through suburbs following signs towards the centre of Santiago. As suburbs become city and city then becomes old town, our conversations and humour subside to a more personal inner calm. I’m contemplating how I will feel stood in front of the Cathedral, knowing I’ve walked over 1500km to get to this point, I’ve raising money for an amazing cause, I’ve built websites and written press releases and done so many things to be where I am about to be… I break the silence and make some funny comment just to stop myself from becoming overwhelmed by my emotions. The plan is, find the Cathedral, then a hotel to dump our packs, then go to get our Compostela’s, before waiting in front of the Cathedral for everyone to meet. We walk down some steps and turn to our left, there in front of us, stands one of the most humbling buildings ever built. We all take a moment to gaze upon the magnificent structure, and then just like tourists, we all take pictures. It’s just before 7am and the morning sun hasn’t actually shone across the Cathedral yet so we wander around until it does, it is an amazing sight. Next job, find somewhere to stay… The Parador stands proudly adjacent to the Cathedral but it’s a little out of my price range. We had passed a couple of smaller hotels on the way in but Katja has a piece of paper with information about rooms from €25 so we check it out. It takes us nearly an hour to find the place, (and yes you’ve guessed it, being 8am, it was closed…), next we find hotels out of our price range, then an apartment, but as Katja inspects the bedding the guy throws us back out?! (A very rude man that is supposedly a hotel manager as well, I think he’s in the wrong trade but instead of telling him I just call him a few names before marching off). My stress levels are rising and the Parador is looking more likely with every step. We find a very trendy cafe who advertise rooms, good prices, oh no, it’s in the same apartment block as the muppets rooms! Katja stays but Bruno and I decide against it. I’m about to give up hope when we walk past a casa something, we go and ask. €50 for a double, it’s nice, really well done out, it’s a done deal. So bags dropped off we go and get Katja before heading to the pilgrims office. It’s nearly 9am and the queue is fairly long already. As the queue moves steadily forward we turn around to see Carlos, Jonathan and Ava. Neville appears a little later (with his war wound…he fell after O Cebreiro splitting his hand open and needing stitches)! We are all happy to see each other and after we are handed our Compostela’s (I begin to realise I’m holding two months of walking in my hand) we go to find breakfast. As a celebratory breakfast we all deserve churros con chocolate, (all the weight I’ve lost may be going back on…!?!). After breakfast we arrange to meet at 11am for twelve o’clock mass. The place is heaving, we find seats in different areas, I am sat with Bruno, Neville, Nikki and a young Estonian girl. The service begins and to mine & Bruno’s dismay the pilgrims who started furthest away aren’t mentioned (only nationalities walking the last 100km, just to show how commercial the Spanish Camino has become! ), also they don’t swing the botafumeiro (worlds biggest incense burner). After mass we regroup and find a bar to sit outside. The sun is shining and the beer is cold. Protesters march past, the amount of people involved is incredible, some more vocal than others but at least they’re standing up for what they believe in. The rest of the day is spent with friends made on the Camino, pilgrims who may have only met me fleetingly and others lost back in France. The atmosphere is special and unforgettable, I’ve met such amazing people, some will hopefully stay in touch, and others will probably drift into the night, but they will always be in my memory. I feel sad as everyone is planning to leave tomorrow to Muxia & Finisterre but I’m leaving on Tuesday as Jaz is arriving tomorrow, (which is going to be amazing as I haven’t seen her for two months, but I’m also a little nervous?! 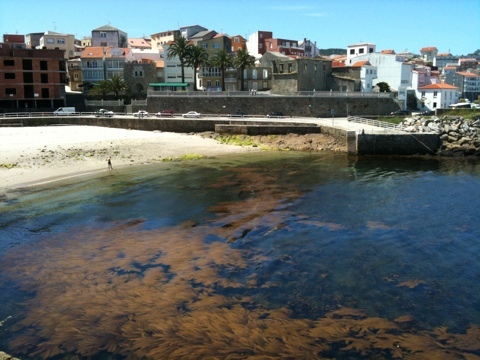 )… I hope I see everyone at Finisterre before everyone leaves, I’d like Jaz to meet them! Tonight I’m spending in good company with new friends and acquaintances, tomorrow is a new day.